Q: What’s scarier than a Halloween horror movie? A: A 7 pm Orgo exam! Yes, my friends: this is not a particularly festive Halloween for the Georgetown post-baccs, who are quivering with dread at our second Orgo test. It is, however, one of my favorite holidays (you had me at pumpkin and horror movies), and it would be remiss of me not to at least post something orange. I haven’t gotten everything right in my return to student life, but one thing I have managed to do admirably is to maintain wholesome and pleasurable eating habits. Even on my busiest days, I try to whip up at least something that’s as tasty as it is healthy. 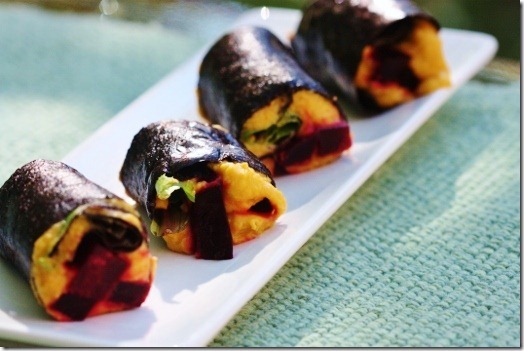 Yesterday, this was one of the speedy snacks I made to keep me company in the library: a seasonally orangesweet potato hummus and beet nori roll. As you all know, I have an untraditional approach to nori rolls: I rarely ever make them with rice, but I often make them with nut pates, hummus, jicama or parsnip rice, and even leftover juice pulp. 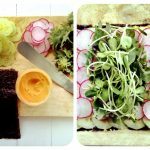 I also always add veggies: this is a great way to use up odds and ends from your raw veggies, and it’s also a nice way to finish off some leftover salad (I often stuff kale salad into my nori rolls). 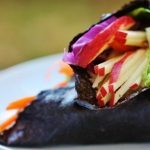 Nori rolls are fast, easy, and they’re a nice, raw alternative to regular whole grain wraps, without having to go through the trouble of dehydrating a raw wrap recipe. Plus, you get the added benefit of a nutrient-dense and iodine rice sea vegetable: what’s not to like? I love the color of this beautiful and unique roll. It’s not quite Halloween coloring (I’d have to find a black vegetable, which is rare and doesn’t sound particularly appealing to me), but it is vibrantly autumnal. Additionally, sweet potatoes and beets taste fabulous together, and the touch of sesame in the hummus recipe makes it all sing. 1) Spread about 1/3 cup hummus over the bottom half of your nori sheet. 2) Add the beet matchsticks and greens to the center of the hummus. Roll the nori sheet up, starting at the bottom edge and moving to the top, and seal the nori with some water. Cut into slices, and serve. A quick, easy, veggie-packed, and flavorful snack. This is also a great lunch component, and would be a fantastic accompaniment to a nutrient dense salad our soup. 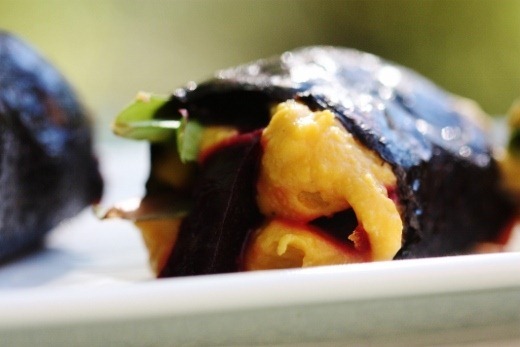 With a little creativity (that is, thinking to stick some hummus into a nori roll) and color (orange+scarlet) it’s easy to make even the busiest of days a little brighter. And on that note, I have absolutely no business blogging today. Wish me luck this evening, and Happy Halloween! Tomorrow’s post will feature a Halloween themed sweet treat, which I promise you will be more tempting than leftover trick or treat candy. Previous Post: « Spicy Curry Kale Chips–Raw and Vegan! Good luck on your exam! Not cool that it’s on Halloween! this is the perfect roll for me! 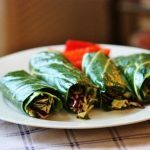 i don’t use rice in my nori rolls either and this is a perfect way to break my cauliflower rice rut! i love raw beets as well but only if they are small bites, they will wreck your teeth hah super crunch! best of luck tonight, i know how horrid orgo exams can be. you just have to train your hands to follow the mechanism for each reaction. i think it’s so hard because we can’t see all the movements with our eyes..well at least that was my problem ha! Good luck, Gena!! Remember you have superfood super-brain-powers! (Placebo/framing effects are big on exams!) And those rolls look perfectly Halloweeny to me- orange and black, plus blood red!? I’m behind on your blog, but those kale chips have me salivating and inspired to go hunt down a green-colored lunch! You may think you have no business blogging but that recipe was worth sharing. I love that you don’t use rice. I am just..meh…with rice. I’d much rather have something like sweet tater hummus which is full of flavor compared to rice which always seems much more lackluster to me. And I bet the crunchy raw beet with the soft potato hummus is a great texture contrast. Sounds perfect! last night i was at an omnivore dinner (not a party) and brought sushi for myself. i couldn’t afford or have the space to make enough for everyone, sadly, so it was just going to be for me while the rest of them ate meat. but someone thought it looked so good they helped themselves. i was glad that it attracted them even though it was veggie sushi, i think it’s an appealing dish for anyone. i love the idea of sweet potato in there. hijiki is a black veggie! Good luck on your Orgo exam! And thanks tens of times over for introducing me to the idea of fillers other than rice as the foundation for nori rolls! I like rice in mine, but when I make sushi at home I am often put off by the idea of making the rice (lazy, I know…), but to use leftover dips and such – GENIUS! Thank you for reminding me to make your sweet potato hummus again – it was one of the first recipes of yours I tried a few months ago and quickly became one of my favourites. These rolls look exquisite – I love how the beets “bleed” into the hummus, very Halloween appropriate 🙂 Good luck on your exam! These look delicious and I love the fall theme. I need to start making my own sushi and getting creative like you! Good luck on the Orgo test tomorrow!! Good luck! 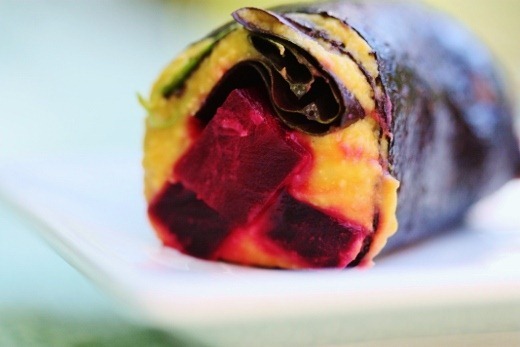 I never would have though tot combine sweet potatoes and beets… and I have both in my fridge right now… perfect! Looks great! I harvested the beets from my garden last weekend, so I may try this. Good luck on your exam! I love sweet potatoes (or butternut squash) in hummus. It elevates it to a whole other level, which is saying a lot considering how good hummus is on it’s own. Yum, great idea, they’re beautiful! Yikes on the exam, good luck! These look wonderful and the pics are amazing with vibrant colors! When I read your blog suddenly I remind my college canteen days with my friends. But today they are not with me, all are engaged his personal life. But still they want to meet me and me also. Do your exam without any tension. Be free mind. Best luck your exam. oh what a great combo! 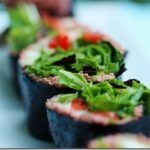 you seem to never run out of new nori roll ideas! These nori rolls are gorgeous! Wowie. The colors in the nori rolls are outstanding!!! Beets + Sweet Potatoes are like heaven together…all of that earthy flavor combines well! I hope the exam went well! I, in all seriousness, was just wondering what to do with a couple sweet potatoes and beets I have lying around. You are a mind reader!! Beet and yam is such a wonderful combo visually (I’ve used it before like that) but having it enfolded in the black nori sheet takes it all to another level. Hey girl! These look beautiful! 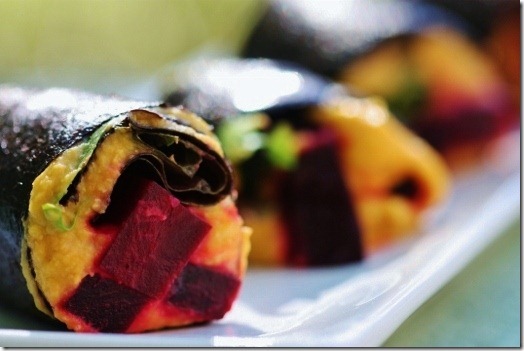 I love love love me some beet, and I have just been getting back into sea veggies as well. I think that these are an amazing idea. My mom actually called me this morning, asking if I had seen your post today! She will certainly be making a batch of your sweet potato hummus, if nothing else! I hope your exam went well!! Love and hugs! Oh wonderful. I’ve been meaning to make the hummus for the last few weeks and have some beets to use up as well. I feel I should probably disclaim that I’m not vegan but I’m always on the lookout for ways to add more veggies into my diet. I think it was visual appeal of this concoction that led to me deciding to try it. While I did a HORRIBLE job of rolling (and discovered that slicing is mucho easier when the roll has chilled), the taste was amazing. First time I’ve ever eaten beets. I’m hooked. Now I have to see what else I can sneak beets into. this looks amazing!!!!! miss you! I like raw beet as long as it’s thin enough! I love nori and I used to eat it more regularly but this reminded me that I’ve been neglecting it for far too long! Thanks for the beautiful inspiration! Looks delicious! In your experience, how long does it last in the fridge? Only a day or so — it’s delicate. I am very confused at the difference between sweet potatoes and yams. To me, sweet potatoes are lighter in colour, and yams are a dark orange. Your beautiful photo looks like you are using yams. Is there a difference between the two?